On The Road To The World Cup, U.S. Women Tie Japan 2-2 In a rematch of the 2015 World Cup final, the Americans had many chances but settled for a draw. As the U.S. looks to defend its World Cup title this summer, its lineup remains a work in progress. 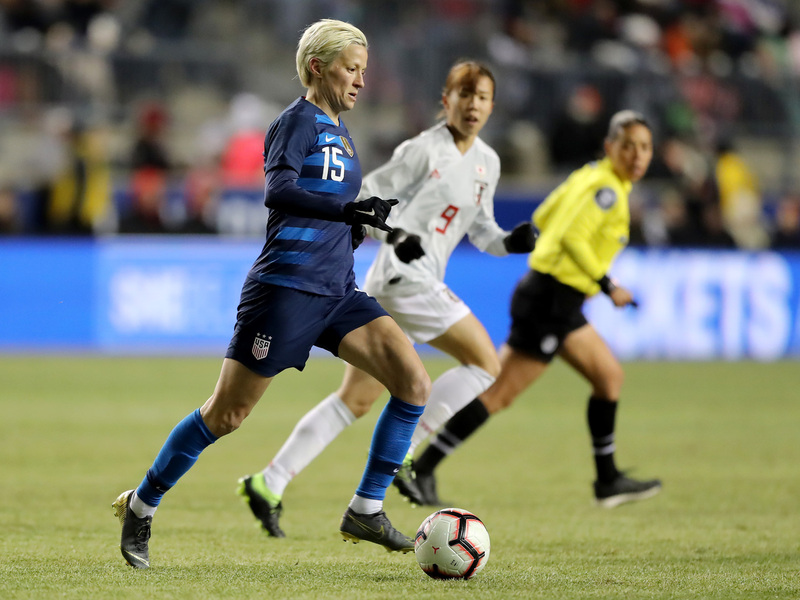 U.S. forward Megan Rapinoe takes the ball as Japan's Hina Sugita stays close on the first day of the SheBelieves Cup in Chester, Penn., on Wednesday night. With just a little more than three months to go until the Women's World Cup in France, the U.S. squad is looking for proof it has all the right ingredients to affirm its ranking as number one in the world. But as the team left the pitch Wednesday night after a 2-2 tie with Japan, they acknowledged there's still some tinkering to do – and that if they're to defend their World Cup title, they can't afford to make many mistakes. It was the first day of the SheBelieves Cup, a tournament hosted by the U.S. in the run-up to the World Cup, which kicks off June 7. The game offered a rematch of the 2015 World Cup final, when the U.S. beat Japan 5-2. But both squads have changed significantly since then, and this four-team tournament provides a chance for each team's coach to try new lineups — and see who will be making the trip to France. But summer felt far away on this cold night outside Philadelphia, as a biting wind rolled off the Delaware River. Many players wore gloves, and spectators hesitated to take off their hats for the singing of the national anthem. There were many young fans in the stands to catch the doubleheader — an earlier game saw England defeat Brazil 2-1 — and a high pitched chorus rose in excitement every time Megan Rapinoe, Tobin Heath, or Alex Morgan started on a breakaway run in the game's early minutes. Things started to go the Americans' way in the 23rd minute, when Heath made a low cross that found Rapinoe, who slid it past Japan's goalkeeper. The U.S. followed with numerous shots by Rapinoe and Morgan, but none found their way into the net. In the 67th minute, Japan finally got its chance. Emi Nakajima bent a left-footer up and over U.S. goalkeeper Alyssa Naeher to tie the score. The momentum shifted to Japan, until the U.S. brought Christen Press off the bench midway through the second half. Almost immediately she found the ball and sent it to Morgan, who knocked it into the goal with her chest. The U.S. seemed to have the game in the bag ... until stoppage time, when Japan's Yuka Momiki made a goal off the crossbar to tie it up in the 91st minute. This was the U.S. team's third match of 2019. The first was a 3-1 loss to France last month at Le Havre, the port city where the U.S. will play Sweden in the group stage of the World Cup. A few days later, the USWNT beat Spain, 1-0. After the game, Rapinoe said the result showed that the team needs to work on closing games — and controlling them. "I think we still take too many risks when we don't need to," said the veteran forward. "And we should probably be more patient and wait for a great opportunity, instead of a half chance." She noted that it was the team's third very different lineup as many matches. "We're obviously still nailing that down." U.S. coach Jill Ellis said she was disappointed in the result, but not in the players or their performance. "I thought there were some really good things" in both halves, she said. "I felt like we played as a team. We made two mistakes in the back that cost us. For sure we left things on the table. But in terms of our team play – what I asked the team to do defensively, the work ethic, the attacking — we got into their goal zone 34 times." She said she was going to take the positives from the game — and the team's job is simply to keep getting better if it's going to win another World Cup: "We have to play seven games to win this thing." The U.S. will face England on Saturday in Nashville, Tenn.